How to keep your moving costs down: first make sure you hire reputable movers! A few weeks ago I had a writeup about the true costs of relocating. It turns out that it can cost upwards of $10,000 to move to a new town. When I moved from a 4 bedroom home in one town to a new home that was 30 minutes away, I recall how I needed to spend $1,500 for a one day lease of a mover’s truck plus the assistance of two or three movers. It wasn’t bad at all, but then again, we had also moved many boxes of items ourselves while relegating the larger pieces of furniture to the professionals. It seems like it would be a whole different story and a whole different price range if you decide to relocate to a different state or even to a different country altogether, which is actually what a relative of mine is planning to do within the next few months (hence the inspiration for these posts). So if you’re in the same boat, here are some thoughts on how to keep those costs down — would you be able to have someone else foot the bill? 1 in 3 employers have recently paid moving expenses for a new employee. For paid relocation expenses: 40% of employers agree to pay more than $1,000, 33% would cover more than $2,500, and 10% would pay at least $10,000. More than half of respondents are willing to move to a different location. Top 5 states to move to? Florida, California, Arizona, North Carolina, and Colorado. You may already know what country, state or town you’ll be moving to, but you’re still going to be facing the big decision of figuring out what neighborhood to settle in. Researching the best places for your needs would be a start followed by some visits to the actual areas once you have narrowed down your options. The more you know, the less costly things can be once you actually make your trip there. A great tip would be to visit your intended place of residence on a working day to see traffic trends and find out what a typical commute feels like. Is there anyone you know who lives in the new area? Find out all you can about the neighborhoods, schools, commute, local prices. Do the math. Know the cost of living in your target city. This was one of the major sticking points I had with my relative, who plans to make an international move. If the main reason for the move is financial, then relocating to a more expensive city means that you’d need to make even more money just to maintain the same standard of living. For moving within the United States, here’s a cool calculator you can use to see how much more you’ll spend by living elsewhere. Hmmm…. moving to Flagstaff, Arizona from San Jose, California looks tempting by these numbers 🙂 . Rent your new home for the time being. 41% of people surveyed who have moved for a job said they rented an apartment, while 36% bought a house right away, 5% initially stayed in a hotel for an extended period, 4% purchased a condo, and 16% said they made other arrangements (such as staying with friends or relatives). I was surprised to see that over one third of new settlers immediately bought a house, but then again, it may be due to the fact that they know their new town well or are decided upon staying for good. In general though, it’s highly recommended that you rent a house once you move to your new community. You’ll never know how long you’ll be staying there and you may want to get a feel for the area before committing to a piece of property for the long term. Take note of the 2 year tax rule as well which states that you’ll owe capital gains on a home that you sell if you’ve only owned it for less than a couple of years. Moving is like preparing for a wedding or booking a cruise in the sense that there are “peak periods”. If you slate your move for the off season (October to April) then you’re bound to get 5% to 10% discounts on the fees. If you schedule your move in the middle of the month rather than the beginning or end of the month, you’ll get better deals. Make sure you get several quotes and check the Better Business Bureau for a moving or shipping company’s reputation. Discuss your move with your family, friends and loved ones. Get as many opinions as you can from the people you love and trust. Hearing the wisdom of those who know you best and who have more years under their belt should be very assuring. Others may provide you with additional insight on your plans that go beyond just the money angle. Remember that the entire family is affected by a relocation and will shape lives well into the future. It would be just natural for the rest of your inner circle to echo in on this matter. Make use of web site resources or other material to assist you with the moving process. 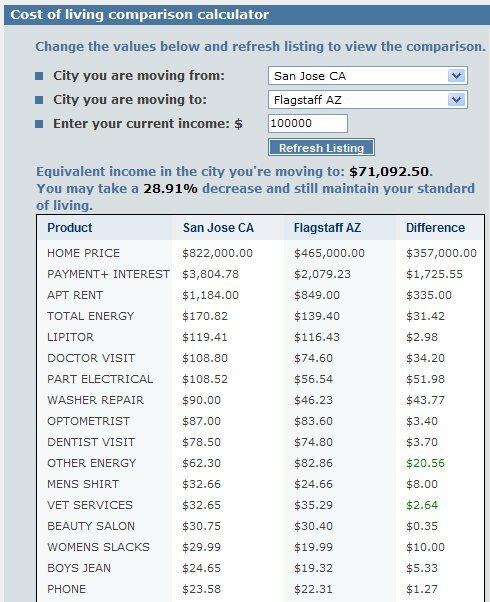 #1 Before you move, check out the cost of living at the city you’re planning to live in by using cost of living calculators such as this. #2 I’ve seen a few shows on television highlighting the sordidness of the moving business, which seems to have its share of scams. So before you hire anyone, check out this interesting web site called movingscam.com to find reputable movers as well as to offer you tips on how to avoid problems with the moving process. Or you can also look at Protect Your Move to find out the consumer complaint history for any mover. #3 Another web site dedicated to helping you move is the American Moving and Storage Association site, which exists to verify your mover’s credentials, license and insurance information. #4 I also found HomeFair.com to be enlightening, where you can find various tools, resources and financial calculators to help you with deciding and preparing for your move. The Salary Tool, Rent vs Buy calculator and The School Report were some tools I found of great value. Cool stuff! #5 And finally, if you’re bent on buying into the local market, you can find out the region’s home sale values at Zillow.com or Domania.com. Much luck on your relocating adventure! When we moved a half way across country, my new employer was originally set to pay the moving costs, so we had a moving company come out and survey our stuff. The quote was in excess of $10k. We thought that was completely insane, so after calling around, we rented a uhaul and dolley and did the move for less than $1500 (Gas included). A lot really depends on the amount of stuff one has accumulated. Fortunately, we didn’t have a whole lot of it which made it much easier for us to move. If you decide to rent your own truck, it’s important to make sure that you know the real price of the U-Haul. It won’t be the $39 or whatever they advertise, especially if you’re moving across state lines. It cost us about $200 for a fairly small truck. Good topic! When we moved 400 miles away, my husband’s company paid the expenses. I believe we’ll have to claim the value of that as income on our taxes (but I’m not 100% certain). A moving company came and took care of everything, from packing to moving. It was awesome. We could have moved ourselves and the company would have paid us. It wasn’t worth the hassle, though. P.S., the spam protection is trying to tell me that 7+9 is something other than 16. What? True, it all depends on how much “house” you are moving. This is one good reason why you don’t want to accumulate too much clutter. Moving is actually a good way to get rid of the things you no longer need and declutter your life. When we moved house, we found that we had stuff that could fill up our garage 4 times over. It was ridiculous! We got a dumpster and simply tossed everything out. Some of the stuff we were able to sell and donate away. No sense in moving and hauling all that old junk to the next house! And Kacie — sorry about my spam blocker. There is something quite wrong with it and I’m still looking to replace it, which should be soon! Seems like anything that adds up to 16 fails… 🙁 Thanks for pointing it out! Thanks for this post – great picture! Ha! I am considering a job offer or two that may include relocation. . .Your post will help us in that decision. I totally agree with renting before buying so that you can get a feel for the area before committing. My sister did not do this, moved into what she thought was a nice part of the city, and is now regretting her decision. 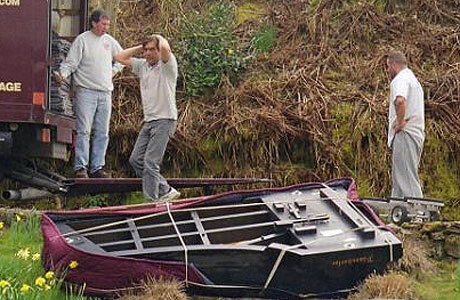 Love the pic – it’s from a video that was on the BBC last year – sad but funny. When the company that I’m currently working right now decided a relocation for our new office I was doubtful if I’m going to come or just resign. What I have thought was the expenses that I’m going to spend if I’m gonna come with them because the company is relocating to another state. The good thing was the company come up with a relocation allowance that for me is enough to provide me the expenses that I need. You can go to a site like Uship.com and place your shipping needs out to bid. You might find a trucker or independent mover for less. I used it and was very happy. when I moved to Phoenix, AZ, I had to cash in some of my retirement to make the move, but then I was not moving for a job but rather just wanted to make a new start. The expenses really soared when my new roommate, whom I had just met, decided that he would mooch whatever he could off of me, and then I found I had to move out just to escape that financial black hole. Moving is fun, but you’re right to say it’s definitely expensive, and certainly right to say anyone moving needs to plan carefully. If you are moving please use a reputable moving company who are bonded and insured etc. Please don’t be tempted to hire van outfits who come on the scene and who are really cheap. They are cheap because they have no overheads i.e insurance etc so please pay that extra bit to care for your stuff. Very true: when it comes to packing and moving there are too many scam companies out there who charge exorbitant rates upon delivery. I work for a removal company in the UK and I can say that whilst moving costs can be very expensive it really comes down to what you have to move and where you’re going to. You should expect expensive prices if you’re going hundreds of miles, possibly thousands and have a fully furnished five bedroom home. My best advice is to use a smaller, possibly family owned company – they tend to be a little cheaper and also actually care about your possessions whilst in their care. If you try to move during the week instead of a weekend that can also save you money. I loved moving until I had children. Because once you have a child, you have to think of them and stability, not about your fun. But if you have the opportunity, you can change your town, because it is fun! I like the idea of renting out your current place while looking to relocate – or even afterwards if you can afford it. Something else that I’m looking into is placing your current home up on sites that offer vacation rentals or weekend rentals for people on vacation or just wanting to stay somewhere other than a hotel. This can help pay for scouting out a new location, or if done right, can pay for a move. This obviously depends on your location, but should be applicable to a large portion of those interested. I also live by the “leave it or sell it” when moving. Much of what we own can be easily replaced. That doesn’t mean it goes to the junk yard – just that I only need so much and the rest can be had easily at my new location.